Heavily used documents tearing out of your binders? You can prevent materials from tearing out by protecting and reinforcing the entire edge. Peel off backing paper and apply to materials to strengthen or repair torn pages. Easy to punch. Size: 10 3/4 x 1. 200/BX. Hi, I'm Griffin at C-Line, and today we're going to talk about our Self-Adhesive Reinforcing Strips. These heavy duty self-adhesive strips help prevent materials from tearing out of your binder. The strips are easy to apply and will strengthen and repair torn pages in your binder by protecting and reinforcing the entire edge of the page. The reinforcing strips are super easy to use. Simply peel off the split back liner and carefully line up the strip to the edge of your paper. Now use the adhesive to anchor your strip to the page, peel off the liner, and run your fingers along the strip to secure the entire edge. For extra strength, apply a reinforcing strip to both sides of your page. Once applied, the strips are easy to punch using a hand-held punch or a three-hole punch. You can even custom punch holes to fit binders with different ring configurations, like a day planner. The 10-3/4" x 1" strips can be trimmed to accommodate different size materials for a binder. For instance, a 4" x 6" recipe card can be reinforced, punched, and added to a recipe binder. 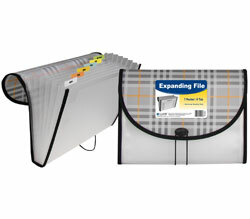 C-Line Self-Adhesive Reinforcing Strips strengthen and repair torn pages and prevent them from tearing out of binders. You'll find hundreds of uses for this versatile product in your home, school, and business. Order yours now! That's all we have for today. I'm Griffin at C-Line, and thanks for watching.